My blog is intended to be a hub of knowledge around Technology, Mobile & Web Application Security, Cryptography, Coding and Hacking. However, this is a very different post. This is a post about a toxic culture that I want to leave behind and don't be part of anymore. Honestly, I also just wanted to vent. I was born and raised in Guatemala city. I lived there until 2013, which is when I moved to Canada. Moving to a new country and a new city was scary and exciting but most of all eye-opening and educational. I've learned more about different cultures and diversity in the past 5+ years than I ever could in all my time in Guatemala. Don't get me wrong, I love Guatemala but moving to Toronto was one of the best decisions I've ever made in my life, love living here. Toronto is one of the most diverse cities in the world. Just on my way to work, which is a 23min walk, I've heard as many as 8 different languages being spoken around me. I've met people from all around the world like Rumania, Venezuela, Japan, China, Singapore, India, Dubai, Germany, France, Brazil, UK, Iceland, to name a few and I met all these people without traveling outside of Canada. Meeting people from different backgrounds, different life experiences and that speak different languages will give you an amazing view of the world outside what you know. In my opinion these interactions work because we all have at least one common (and very important) characteristic, we are all immigrants, and we are all trying to succeed in a different country from the one we were born in. All of these people I've met, and I'm lucky to call friends now, have showed and thought me to view life in a very different way, specifically speaking about racism, sexism, haterism, exclusion, etc. This sounds all great and fun but back to my angry feeling. As many immigrants, I left friends and family back in Guatemala and one of the easiest ways to stay in touch is through a messaging app, in my case it was WhatsApp. I'm a very shy, quiet and somewhat antisocial person, therefore don't have many friends, but one of my biggest group of friends is the one of my friends from school (most of us were in middle/high school together). The group was created by one of my friends that also left Guatemala and is making a life of his own abroad. This WhatsApp group helped me keep up to date with what happened in Guatemala all these years. But it also showed me something that couldn't see before, something that pushed me to leave that group. Many people around the world have seen how latinos and latinas have been treated in countries like the US. Racism and exclusion against latinos and latinas are very common. But I never noticed we, latinos and latinas, are very racist when it comes to our own kind. Most of us, latinos and latinas, use humour in our day to day interactions, in almost every conversation, when we post things, everywhere and at anytime, and sadly we also use humour mixed with racism, sexism and haterism. Our WhatsApp group was no exception. Many of my friends, and these are dear long time friends, were sharing memes with racist and hate connotations against, latinos and latinas, people of colour in general, asians, middle-easterns, among others. 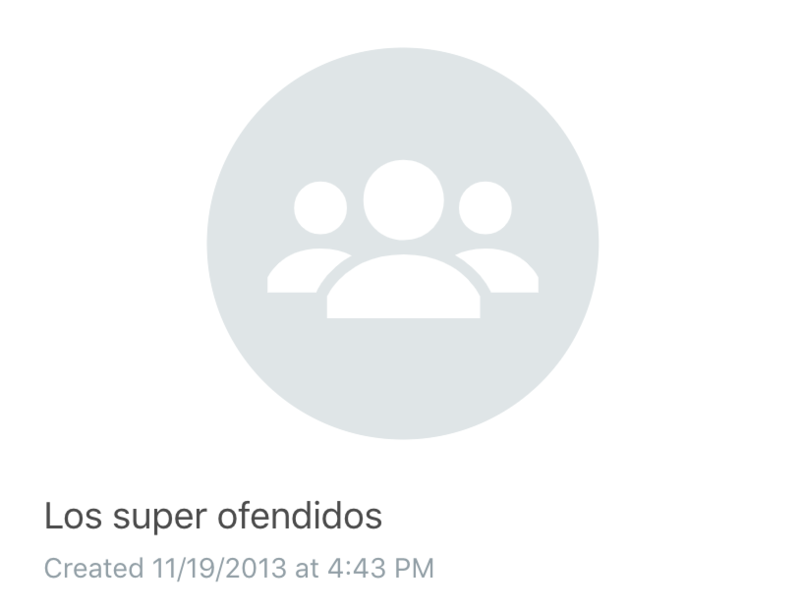 The group is 100% made up of men, so jokes about sexism where almost a daily thing, as well as jokes about our indigenous people from Guatemala which they refer to as "indios" and "indias". I absolutely hate these words when they are used in a racist context. From there, the passive-aggressive comments started flooding the group every time someone would share a racist/sexist meme or joke, denoting how close-minded I was for not laughing at these "inoffensive jokes", and how I "lost my latin humour when I moved to Canada". Many times I stood up to jokes against women, LGTB+ members, vegans, indigenous people and that got me the label of "the offended" or the "not humorous and not fun". Some of them messaged me saying that "I should not care" or that "I should just let it go" and "not take it personally", but I couldn't. Living outside Guatemala has showed me how much people suffer when they are discriminated against and I hated the thought of 10 latinos "having a fun time" at the expense of someone else's suffering. Yes, they are not telling these jokes or showing these memes to those people, but they are laughing at the situations they have to endure in their already difficult life and couldn't be a part of it anymore. I'll never get tired of standing up against this behaviour, but decided that it would be better for my life to not be part of that. Surrounding myself with these kinds of "jokes" is not something healthy for my mind. Reading these racist and sexist jokes was only made worse by the "laughs" that came after, encouraging and reinforcing the behaviour. I'll absolutely miss talking with my friends and staying in touch with what was (and still is) a big part of my life. But this world needs more acceptance, inclusion, diversity and love. ps. Racism and sexism are never funny.